Once upon a time, there were two gardeners who each lived on a small, urban lot in Portland, Oregon. Both fell in love with the huge leaves of Magnolia macrophylla. One gardener bought the first tree she saw and planted it right away, not taking into account that the tiny stick would eventually become a towering, 50-foot-tall tree. The second gardener took her time and researched the options, eventually settling on Magnolia macrophylla var. 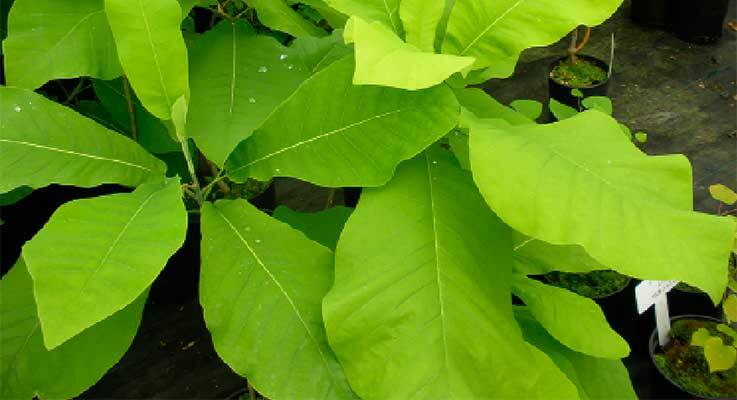 ashei (aka Dwarf Bigleaf Magnolia). The dwarf version tops out at 30 feet tall — still not a terribly small tree, but one much better suited to an urban setting, where a neighbor’s house may be just a few feet away. The overused phrase “right plant, right place” takes on significant meaning when planting a tree in a small garden. Make the right choice and the tree will be enjoyed for years to come. Make the wrong choice and you’ll spend time attempting to manage its size, repair the damage it does, or possibly even face the cost and headache of having it removed. Space available for the home garden is shrinking. The U.S. Census Bureau stated the average size of a home built in 2013 was 2,600 square feet — an all-time high and an increase of 873 square feet over 1983, just 30 years prior. At the same time, residential lot sizes are shrinking. The median lot size of newly constructed single-family houses declined from 10,994 square feet in 2009 to 9,818 square feet in 2014, a loss of 1,176 square feet. In short, today’s homes are bigger, yet have smaller lots. While the space around us is shrinking, the benefits of a dense urban tree canopy are being studied and understood like never before. A healthy urban forest purifies the air and mitigates temperatures, beautifies the urban environment, and provides shelter and food for wildlife. We need more trees in our cities, not fewer. Take, for example, UpShoot’s genetically dwarf crabapples, The Round Table Series.™ Lancelot® (Malus ‘Lanzam’) is the most popular of the group. Featuring white flowers with gold fruit, it grows to 10 feet tall and 8 feet wide. Cinderella® (Malus ‘Cinzam’), the smallest at 6–8 feet tall and 5 feet wide, also displays white flowers and gold fruit, but because of its diminutive size, Cinderella is well suited to planting in a decorative container. Guinevere® (Malus ‘Guinzam’) has a Japanese maple-like form at 6–8 feet tall by 12–15 feet wide, with red fruit, multi-colored flowers and excellent fall color. Zampini also promotes a trio of naturally columnar trees. Golden Candle™ Golden Rain Tree (Koelreuteria paniculata ‘Golcanzam’) is tall, growing to 35 feet, yet extremely narrow at just 4 feet wide, making it a perfect fit for narrow spaces. Large, bright gold flowers bloom at the ends of the branches in spring. Tolerating both drought and heat, in addition to moist soils, Golden Candle is a great fit for urban landscapes. Crimson Pointe™ Flowering Plum (Prunus × cerasifera ‘Cripoizam’ PP19564) reaches 20 feet tall, 5–6 feet wide and tolerates both hot and cold temperatures. This columnar selection of Newport Plum features foliage that is ruby red with orange-bronze new growth. Flowers are white, and the fruit deep purple. For those who value foliage over flowers, Emerald Pointe™ Hardy Rubber Tree (Eucommia ulmoides ‘Empozam’) has shiny, serrated, wavy leaves with a hefty texture. While only 5 feet wide, Emerald Pointe can reach 40 feet tall, requiring a location where height is desired. Brian Bradshaw, owner of Bradshaw Nursery in Forest Grove, Oregon, grows unique ornamental shrubs and trees. As new developments are breaking ground across the United States, Bradshaw agreed smaller lots are the new normal. “We’re targeting smaller trees,” he said. This focus fits well with his emphasis on hard-to-find accent trees of 1–2-inch caliper. As for columnar trees of interest, Bradshaw mentioned a pair of dark-leaf beech trees, Fagus sylvatica ‘Dawyck Purple’ and F. sylvatica ‘Red Obelisk’. Neither are small in stature, reaching 40–50 feet, but both are quite narrow, especially ‘Red Obelisk’ at only 3–5 feet wide. These slow-growing beech trees are said to tolerate the complications of compact soils, air pollution and salt from winter road management, commonly found in city environments. Linda Meyer, owner/residential landscape designer at L. Meyer Design, is fond of the tri-color beech, F. sylvatica ‘Tricolor’, as well as F. sylvatica ‘Black Swan’. She described ‘Tricolor’ as offering the all-important benefit of shade, but with striking foliage color — purple with pinkish-white and rose — and ornamental bark. ‘Black Swan’ has a 30-foot-tall leader surrounded by pendulous branches. Meyer said this towering, narrow tree is a great match for today’s taller houses and has a “Dr. Seuss quality” that makes it a fun addition to the landscape. Bradshaw is a fan of Parrotia persica ‘Vanessa’, a Persian ironwood selection with more of a columnar habit compared to the species. A tree for all seasons, ‘Vanessa’ has beautiful foliage, great fall color, interesting bark on a branching structure, and small, “spidery” red flowers in late winter to early spring. It will eventually reach 40 feet tall to 15 feet wide. David Annand, Northwest sales rep for Bailey Nurseries, a wholesale nursery specializing in bare root and containerized nursery stock, also puts ironwood on his list of trees suited for small gardens. Persian Spire™ Parrotia (P. persica ‘JLColumnar’ PP24951) is a new introduction with fabulous foliage. Slender leaves emerge with a purple cast in spring, then fade to green with purple margins before maturing into dark emerald green for summer. Persian Spire, selected from a row of seedlings by John Lewis, owner of JLPN Inc., matures to 25 feet tall and 10 feet wide. Marley’s Pink™ Japanese Snowbell (Styrax japonicus ‘JLWeeping’ PP23755), another introduction from JLPN Inc., checks both those boxes. In fact, it’s proven so popular Annand reported they’re having trouble keeping it in stock. Zampini feels Marley’s Pink is equally stunning as a feature plant in the landscape or grown in a decorative container. Attendees at the 2014 Farwest Show agreed, voting it a People’s Choice winner in the New Varieties Showcase. Marley’s Pink has a weeping habit, vibrant pink bell-shaped flowers, large glossy leaves, and reaches 8 feet tall and 4–5 feet wide at maturity. Anthony Kinen, owner/manager at Kinen’s Big & Phat Special Plants, an Oregon wholesale nursery specializing in finished trees of all sizes, is looking to the future. When asked about trees well-suited to small gardens, he said it’s not just gardens on the ground that need appropriately sized trees, there’s a whole new frontier of small gardens in the sky — rooftop gardens. “I believe the trends of smaller landscapes with minimal maintenance as well as rooftop green spaces will continue to grow,” Kinen said. “Trees that we select for a rooftop garden application do not exceed a mature height of 12–15 feet, and the majority of the trees in this category do not exceed a mature height of 6 feet.” His list of rooftop-appropriate trees includes Osmanthus × fortunei ‘San Jose’, O. heterophyllus ‘Purpureus’, O. h. ‘Gulftide’, Oxydendrum arboreum, Salix integra ‘Hakuro Nishiki’ and Ilex crenata. Kinen also carries a line of shrubs that have been trained into a single trunked small tree, including several varieties of the always-popular Hamamelis. “The flowers add color in late winter and are a nice visual clue of the coming spring,” he said. Other candidates for this treatment include Disanthus cercidifolius and Calycanthus occidentalis. Meyer is also an enthusiast of Hamamelis and recommends H. × intermedia ‘Jelena’, ‘Arnold Promise’ and ‘Diane’ for their vase-shape form, attractive scent and fall color. Another small, flowering tree on her list is Amelanchier × grandiflora ‘Autumn Brilliance’, a hybrid cross between two species of North American serviceberry. ‘Autumn Brilliance’ brings spring bloom, berries for the birds, brilliant fall color and a mature height of only 20–25 feet. Franklinia alatamaha, a tree that is now extinct in the wild, was recommended by Meyer and Bradshaw. Growing 10–20 feet tall, Franklinia displays fragrant white blooms in late summer. Its narrow, glossy leaves transition to shades of orange, red and purple in the fall. Every Franklinia in existence today is a descendant from seeds collected by John and William Bartram in southeastern Georgia in 1773 and named after their friend Benjamin Franklin.